Kaua'i Traveler Magazine - puts out a tri-yearly magazine in which it features interesting people and events for the island of Kaua'i. These magazines are placed in all of the fine resorts on Kauai. It is also sold at fine stores, and can be viewed online at myhawaiitraveler.com. The memoir Rainbows Over Kapa'a is featured in a six page article. [Click Here] and skip forward to page 60. 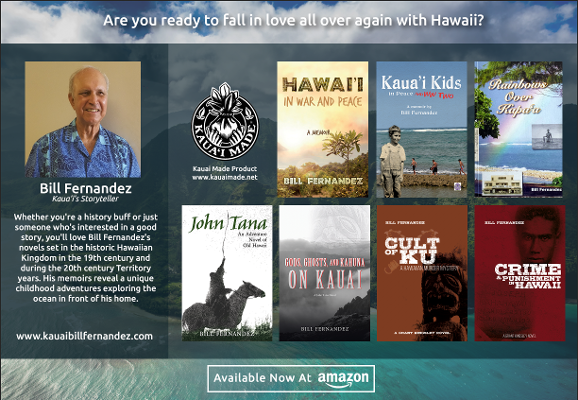 In their Fall edition, IMUA, the Kamehameha Schools quarterly magazine, featured alumnus Bill Fernandez and his memoir "Rainbows Over Kapa'a". Kauaibackstory.com writing contest - a winner!